The Central Board of Excise and Customs (CBEC) takes certain initiatives for Ease of Doing Business under the GST regime; Finance Minister Shri Arun Jaitley launches a Mobile App “GST Rates Finder” to help users to find rates of GST for various goods and services. The Union Finance Minister Shri Arun Jaitley launched a mobile app “GST Rates Finder” in his chamber in the national capital yesterday which is now available on android platform and will soon be available on iOS platform as well. This Mobile app helps users to find rates of GST for various goods and services. It can be downloaded on any smart phone and can work in offline mode, once downloaded. The user can determine the GST rate for a good or a service by entering the name or Chapter heading of the commodity or service. The search result will list all the Goods and Services containing the name which was typed in the Search Box. The user can scroll down the list of description and when any specific item on the list is clicked, the display window will pop-up, containing details such as GST rate, description of goods or services and the Chapter heading of the Harmonised System of Nomenclature (HSN). For example, any person who has been billed by a hotel or a restaurant or for footwear can cross verify the correctness of the rate of GST charged. CBEC has also provided a GST rate finder on its portal cbec-gst.gov.in to help the taxpayers know the applicable GST rate on their supplies of goods and services. A taxpayer can search for applicable CGST, SGST, UTGST rate and Compensation Cess on a supply. The search can be made based on description of goods or services or HSN Chapter or section or heading number. 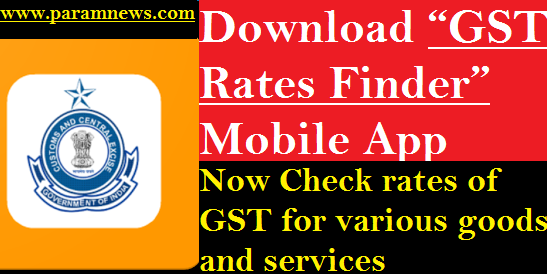 Govt launches a Mobile App “GST Rates Finder” to help users to find rates of GST for various goods and services These initiatives are aimed to serve as a ready reckoner on GST rates. This will empower not only the taxpayers, but every citizen of the nation, to ascertain the correct GST rate on goods and services.